That move I was alluding to? It's happened! Well, almost. We've flown our Eagle's nest, and we've closed on another bird-name address! Yay! Still living in our temporary quarters at a local hotel, but probably mid-next month, we'll be in our new digs. Kate, Gwyneth, and Saylor are here, too, and being little angels if I may say so. We will all be thrilled, though, to not have to use a flat key to get in and out of our "home." 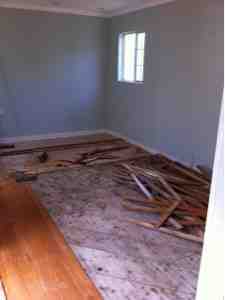 As of today, floors are completely ripped up... More posts to follow. So much going on. New laundry room under construction. Every day it gets better and better, but this will be a long labor of renovation love.